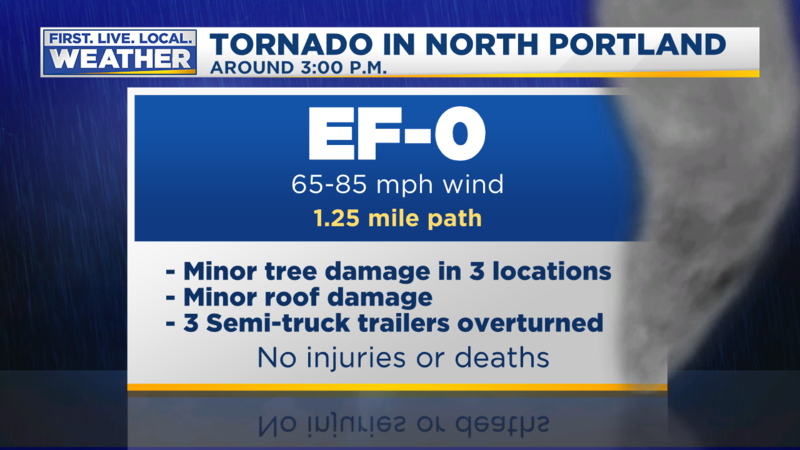 An EF-0 tornado today brought mainly minor damage along a 1 mile or so path at 3pm. Here’s the weirdest part…with every other tornado (even when out in rural areas) we get a bunch of emails/calls or social media posts to the newsroom. This time it was only ONE. That’s it. Apparently no one else noticed a tornado passing overhead. I didn’t see any media tweets or social media postings until the NWS put out the storm report just before 8pm. 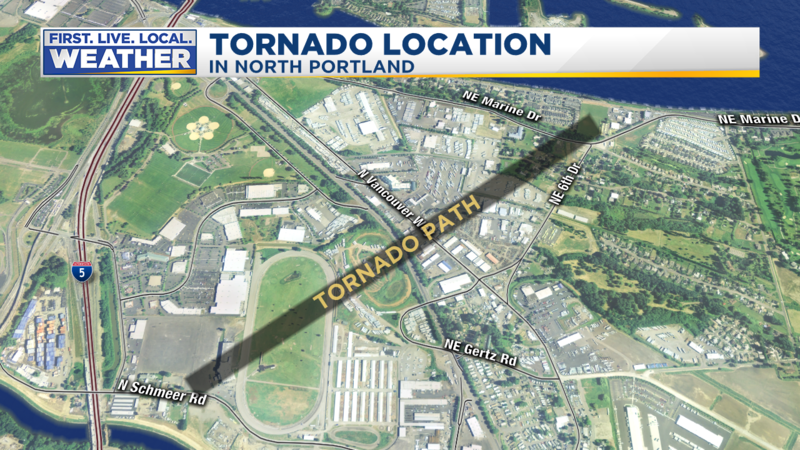 First damage was observed near Portland Meadows and last damage was found along the Columbia River at Marine Drive & 6th. A viewer also sent us video of the funnel cloud still rotating over south Vancouver after crossing the Columbia River. Here’s one of the semi trailers tipped over. This is just behind the Jubitz Truck Stop area. This is the one and only tornado in Oregon OR Washington this year. 2017 saw 5 tornadoes in the two states. That was Bend, Aurora, and Lacomb Oregon. 2016 saw 7, including 4 in Oregon. Those were in Wheeler & Wallowa counties, Manzanita, & Oceanside. Other than the tornado, today’s forecast turned out just like expected. Lots of downpours, then hail, thunder, and sunshine. Sometimes all of them within a 5 minute period too! Tomorrow should be a bit tamer, although we’ll still have some downpours. Up in the mountains it’s snowing for the first time in 3 weeks. It appears about 2″ has fallen at Timberline. There could be another 3-6″ before it dries out tomorrow night up there. Passes will remain clear though. This entry was posted on Sunday, October 28th, 2018 at 10:12 pm and is filed under Weather. You can follow any responses to this entry through the RSS 2.0 feed. Both comments and pings are currently closed. TRASH GFS run. Hopefully next one brings back the strong storm on Sunday (I have a feeling it will). Emptied the gauge last night after a weekend in B.C. 2.35″. Rained a lot in Boston Bar, too; we ended up spending a lot of time in the cabin by the woodstove. FWIW, I took one look at the radar at around 1:30p yesterday, right about the same time we started hearing thunder. I saw how starkly intense the showers were and how they were training from SW to NE, the distance between lines, the speed of the embedded cells, how they held together or even intensified after crossing over the West Hills, etc… showed it to my girlfriend and told her this was a classic cold core tornado pattern for anywhere between Aumsville to Longview, most likely either Turner or Battleground. 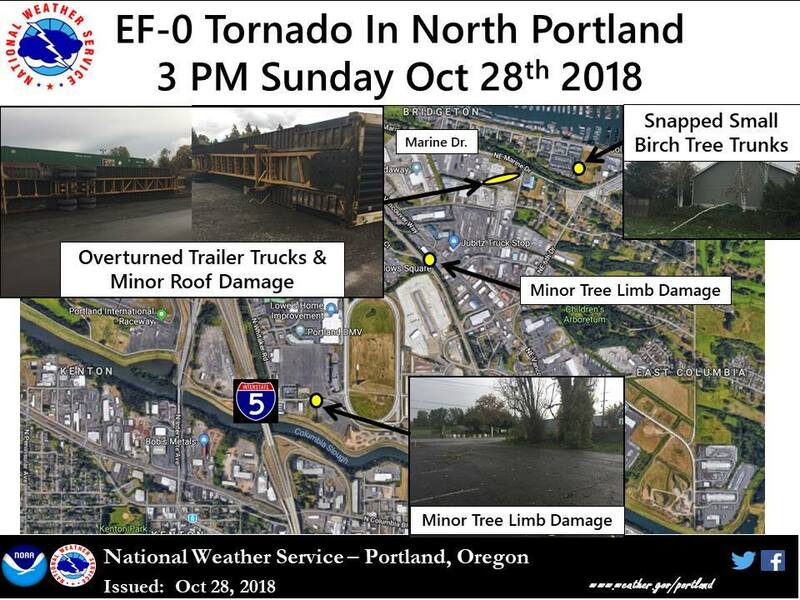 Looks like NoPo was the actual target, but my tornado forecast was 90 minutes in advance. That’s good enough for a Tornado Watch. For years now, I’ve been able to nail that pattern more than an hour, and sometimes as many as 6 hours before the funnels touch down. So why is it the NWS guys always seem to miss it? Or if they do recognize it, why do they always neglect to acknowledge it? I’m probably somewhere around 85% accuracy with my “tornado calls,” multiple instances are even buried deep in this blog. That other 15% consists not of missed “tornado calls,” but rather, entirely of calls that didn’t pan out. In other words, I’ve never missed an actual, but I have had a couple false positives. I knew it was going to be an intense day of showers since at 5am I was having hail (which woke me up) at my place. I also saw the training (which I posted on the other post but then Mark posted another post which then no one saw my post) and said we could have issues with some places flooding. Any raids on local shops? breads,eggs and toilet paper?